You can click on any images in this post to enlarge them. Everybody always wants to know what's in my sketching bag, so I thought I'd take a post and open up the bag to show what materials go with me lately. 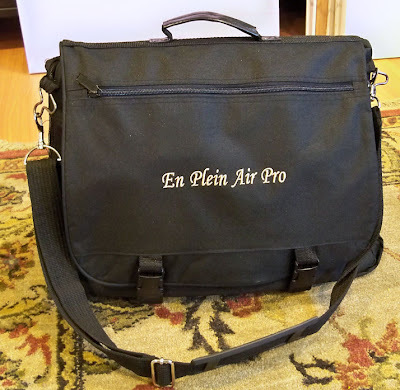 This bag came with my Plein Air Pro easel. It's actually way too small for that. 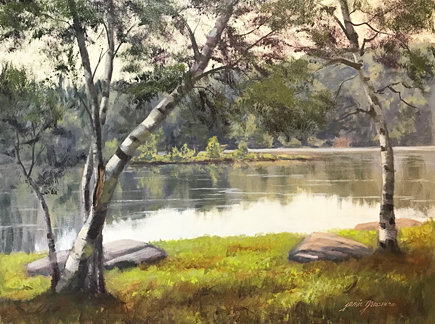 Although it just barely holds the easel, it cannot fit any of the supplies you need to go along with an easel --- like paint and water and mosquito repellent! Meanwhile, my sketching supplies were in need of a larger bag, so it was re-purposed to accommodate them, and the easel moved into a roomy backpack. This messenger-style bag fit the bill perfectly, with numerous pockets, a nice carry strap, and it's super lightweight. 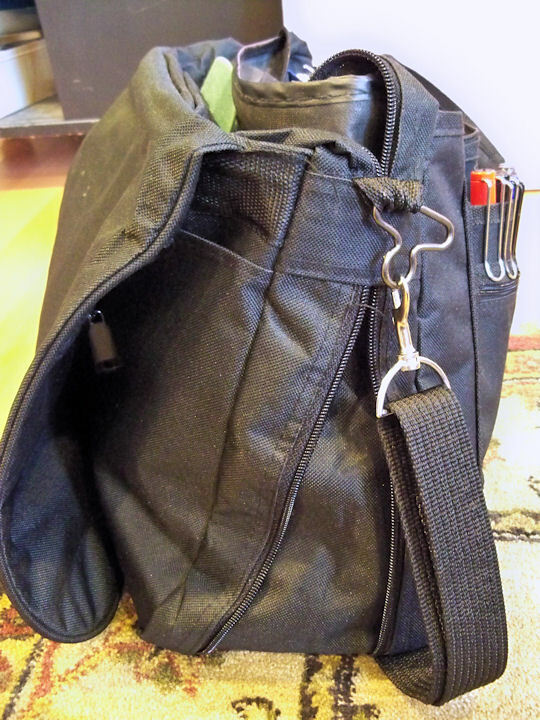 From the side, you can see that it has a zipper to expand/contract the entire back compartment. This is so convenient for when I want to lighten my load. I just remove a bunch of stuff and zip that up for a smaller bag, and I'm good to go anywhere. With the front flap up, you can see all those great pockets for pens, pencils and brushes. The left hand pocket holds all my fountain pens. I've been experimenting with lots of different inks lately. 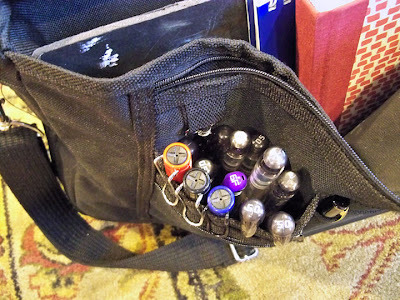 I spread out all the pens in this pocket to show you how I've been keeping track of what ink is in what pen while I'm test driving so many inks. My husband has a little label maker that's come in really handy, so I always know what I'm working with. 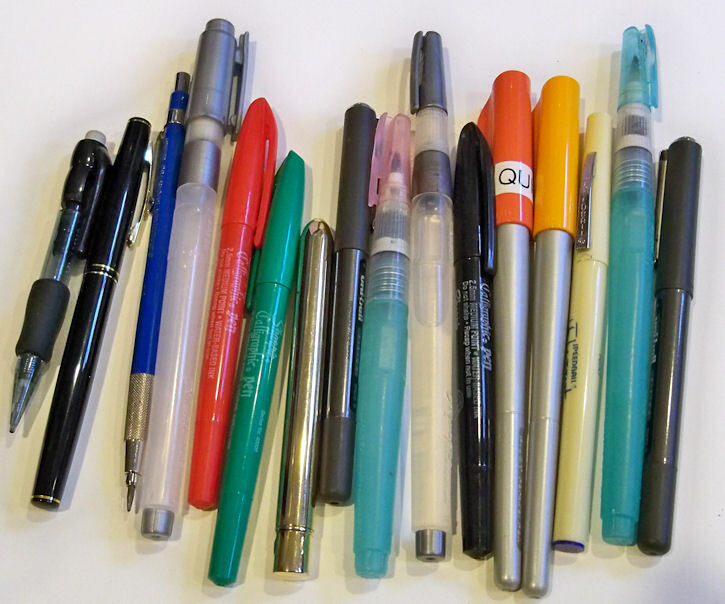 Most of these are Platinum Preppy fountain pens with a 05 nib. 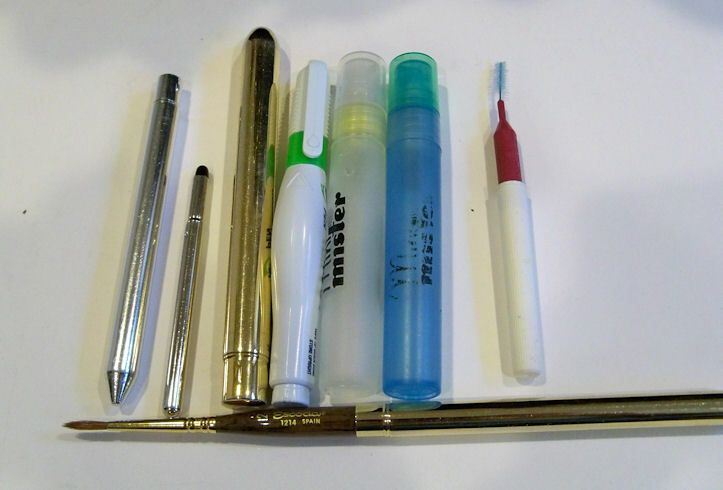 Some have been converted to eyedropper pens (as I explained on a previous post), others I'm refilling cartridges with, and I also use a couple with converters. They're very fast to write with and can easily keep up with my quick sketching. The three colored pens up front are Lamy Safari pens. I like that I can easily switch out nibs on these from extra fine to broad, and they write very smoothly. 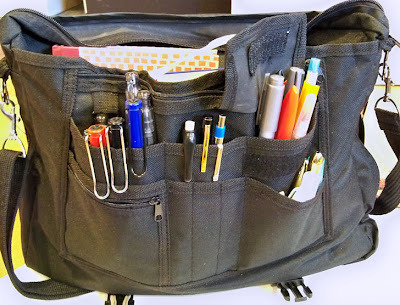 The middle section of the messenger bag is where I keep my sketchbooks and a foamcore board and clips. 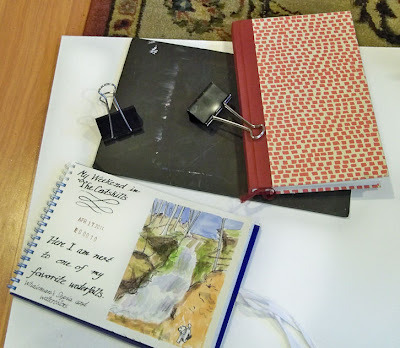 With a stitch-bound, hardcover sketchbook, I keep it open fully by placing the foamcore behind the open sketchbook, and clipping each side to the foamcore. There is no added weight to carry, and it's been a perfect solution to the deep gutter problem. Now for that BIG back compartment....Let's take all that stuff out of there. small plastic container with kneaded eraser inside. This is what the little black watercolor set in the photo looks like when it's opened up. The middle row is supposed to hold a travel brush, but I put extra half pans in there so I can carry more colors. This is my favorite set for sketching. 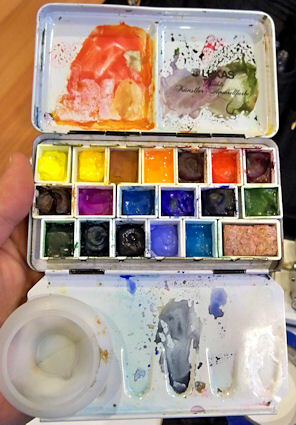 When I use a waterbrush, I don't need to clip on the little palette cup. I set a piece of sponge into a full pan to clean the waterbrush as I go. I can just wring it out when it gets soaked. If I need a larger one, I use one of the clips to attache the extra sponge to the kit. Materials lists of course change over time. Sometimes I empty a lot of it and go with gouache, or colored pencils, or even acrylics to work with in my sketchbooks. Part of the joy of working in sketchbooks is multi-media experimentation. I hope you enjoyed this browse through my sketching bag. 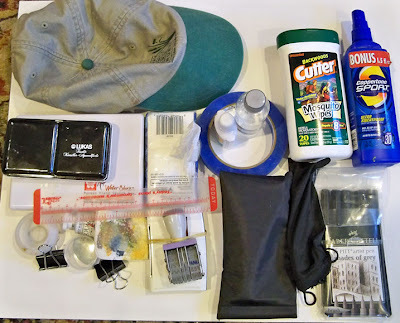 Great post -- always really fun to see what other people carry in their sketching bags! 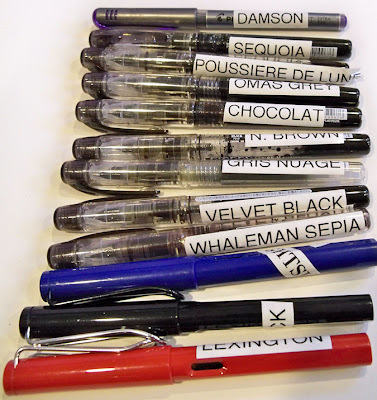 Love your idea of labeling the pens -- I've been refilling Pilot Varsity pens with various inks after the ink in them is used up, and I tend to get them mixed up. Will also have to try the Platinum Preppy pens, they look interesting. I would like, where are you buy a bag.